✅LIGHT & FAST – TESTED BY THE PROS WITH HIGH QUALITY BEARINGS : This professional skipping rope has been developed french crossfiters. The handles are neither too light nor too heavy for optimum workout. You will easily gain speed thanks to the 360° DEGREES DOUBLE STEEL BEARING SYSTEM. Stainless Steel Premium Quality. A Jump Rope that will last, and last, and last… Perfect Set for and incredible Workout. ✅SOLID & RESISTANT: Throw it on the ground during your WOD and no longer be afraid. Unlike other less expensive ropes, Fitness Active Pro has relied on durable materials that do not break. 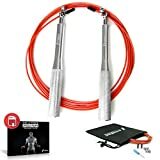 ELABORATED WITH CROSSFITERS, this speed jump rope at affordable price does not sacrifice quality. Ideal for optimal training. Ideal for warm-up, boxing, gym, karate, bodybuilding, crossfit, teakwondo, MMA. Double unders will become a breeze. Suitable for Men, Women, Adults. ✅EASILY AND FULLY ADJUSTABLE TO YOUR HEIGHT: No matter your size: you can adjust the long rope on both sides easily thanks to the clamping system. This rope is adjustable according to your size. The size of the cable is up to 10.17 ft (310 cm) to suit even the tallest. Better than 9ft Jumping Ropes Take this jump rope everywhere. In the operating instructions (guide) we explain how to adjust it perfectly to your height. Excellent for burning calories, and warming up. ✅HIGH QUALITY ALUMINIUM HANDLES + 3 BONUS INCLUDED : Elegant aluminium handles and high quality bearing system. Coated Orange Quality PVC Cable. Unbreakable Handles. Comes with 3 BONUSES: a storage bag with an extra cable, accessories and a digital guide of more than 35 pages in English. Looking for a handy and robust rope suitable for both beginners and professionals? ✓ FAST & FLUID: Slips well during the movement and the steel ball bearings guarantee a uniform and durable speed. ✓EASY TO HANDLE: Ergonomic handles are very pleasant to take in hand and thus promote a better performance. No more problems with low inertia. The handles of the Jump One have been rigorously tested during its development process to ensure a uniform jump. ✓EASY TO STORE: Take it from anywhere with its FREE storage bag! Rather than opting for cheap ropes, we match all our products with an unconditional guarantee that lasts or your money back. Test it WITHOUT RISKS by yourself, you’ll love it. If not, take your Money Back.